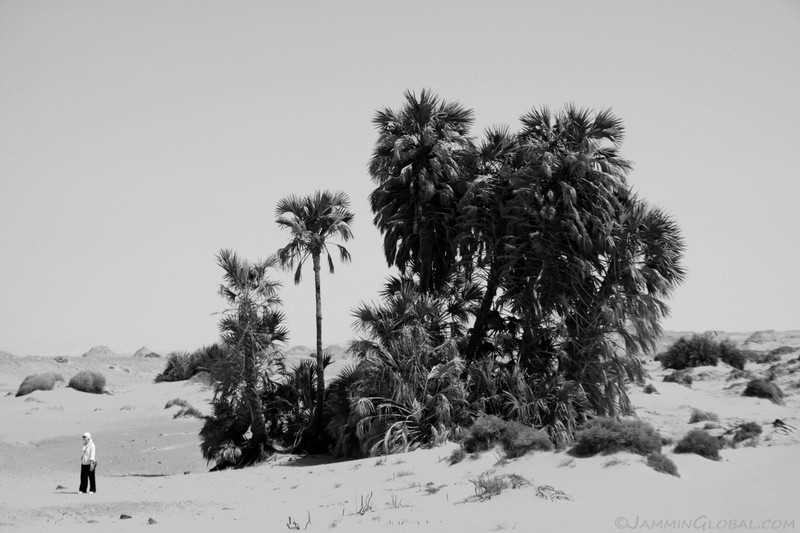 The next oasis south of Farafra was Dakhla. 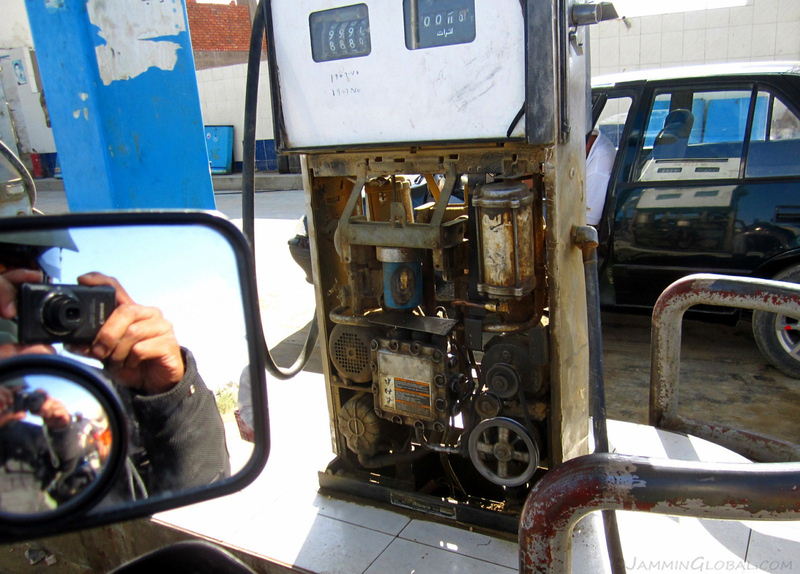 The flat terrain was giving sanDRina very good fuel mileage and by cruising around 90 km/h (56 mph), I was getting 25 km/L (58 mpg). 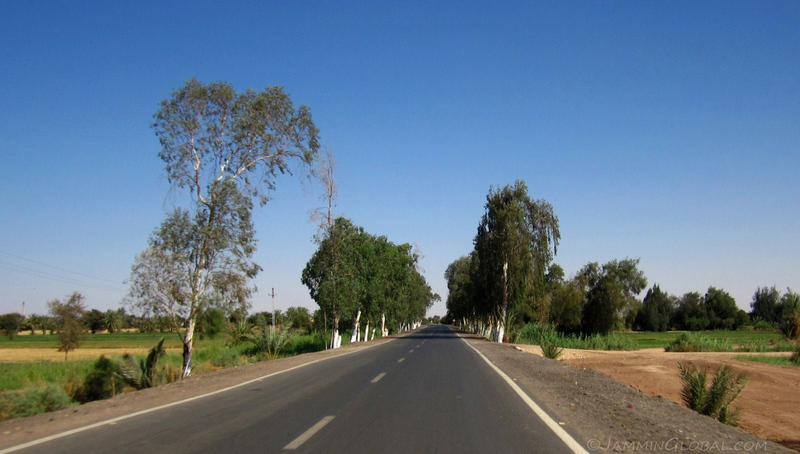 Freshly-planted trees to liven up the desert route. Guess which way the wind blows here… It was past 11 am now and the heat was getting quite intense. I wanted to stop for a few hours somewhere during the hottest part of the day and luck was on my side. 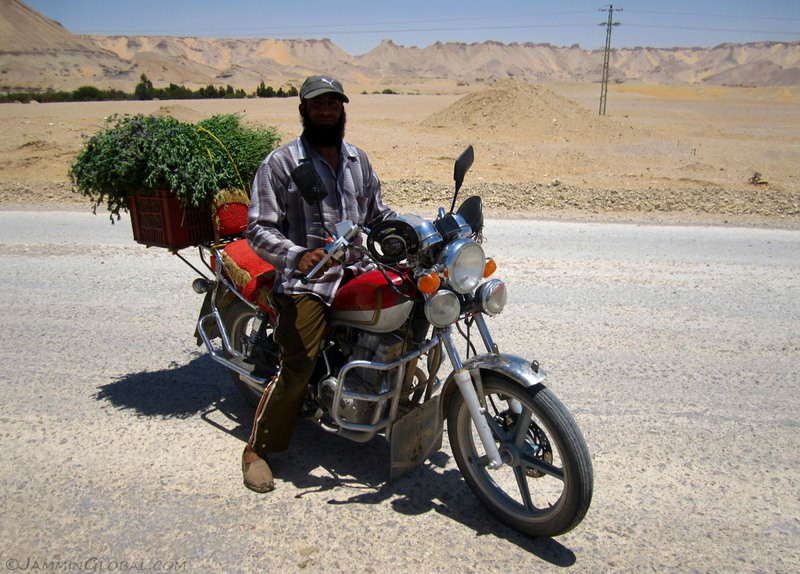 I stopped for a water break near the village of El-Mahoob, about 30 kms (19 mi) north of Dakhla, and Mohammed here caught up with me on his Chinese motorbike carrying some fresh alfalfa. 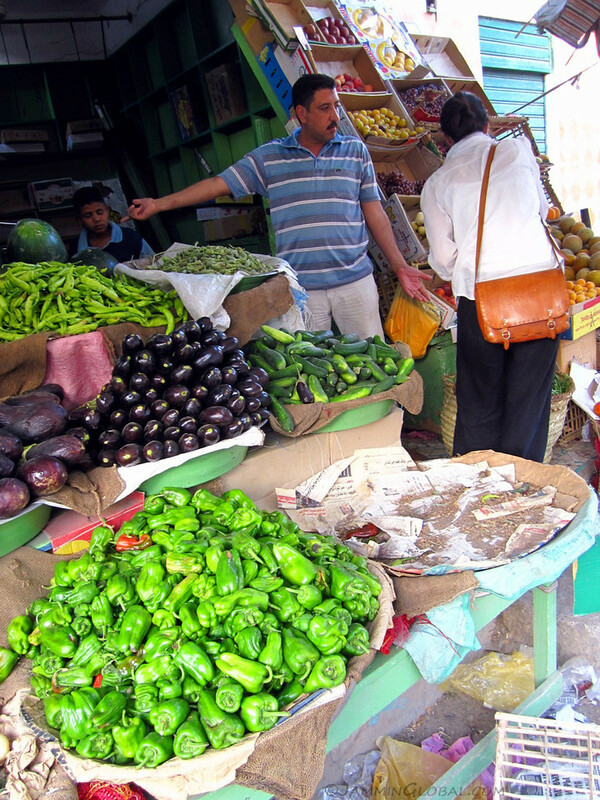 I had only learned a few words and phrases in Arabic and after the greetings he signaled that universal sign for food: bunched fingers pointing to the mouth. He was inviting me for lunch and I thought this would be a perfect way to spend a few hours to escape the mid-day heat. 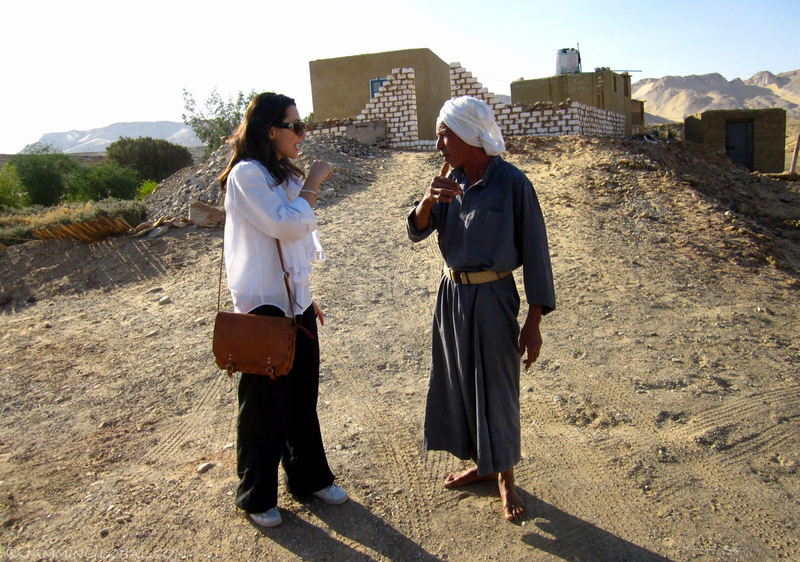 I followed Mohammed for a few kilometers and we soon arrived at his house. I gathered that the building on the right was a newly built addition to his house and the older parts were on the left and behind. 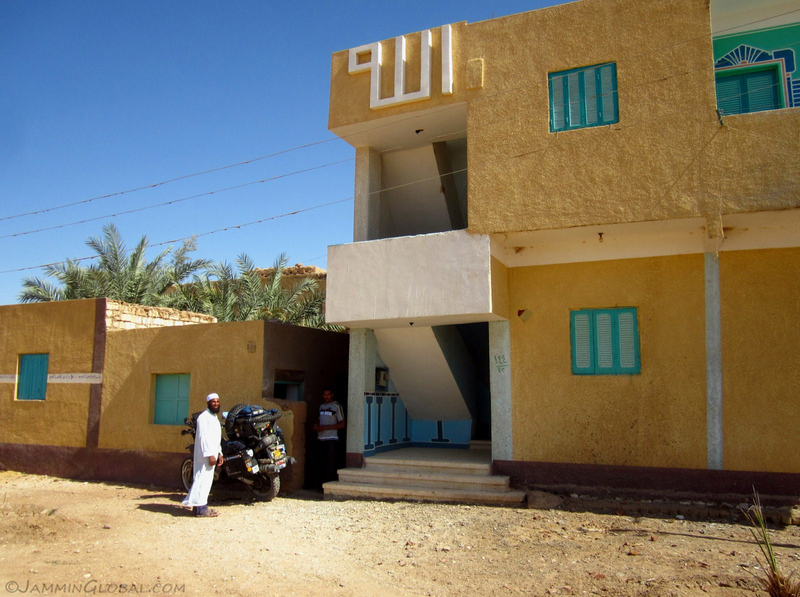 As I learned from my time in Bahariya, the Bedouin people are very hospitable and this is built into their house design. 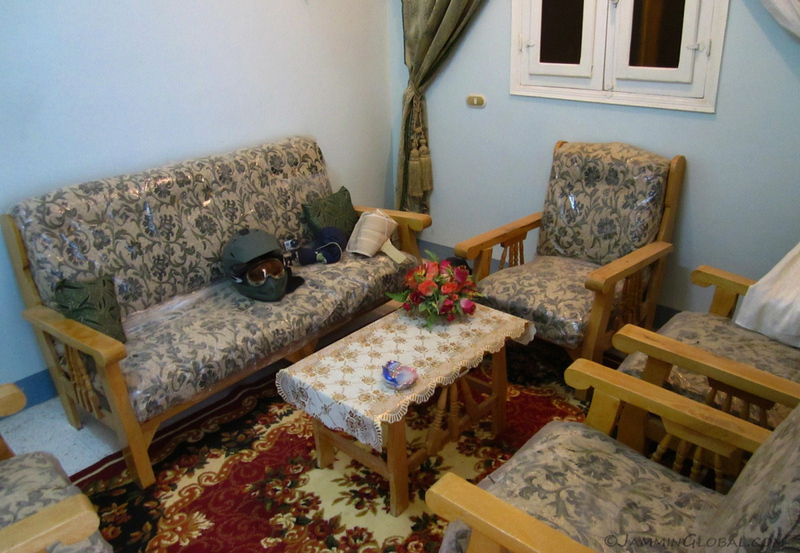 Every modern Bedouin house has a guest room next to their front door for entertaining guests and visitors. 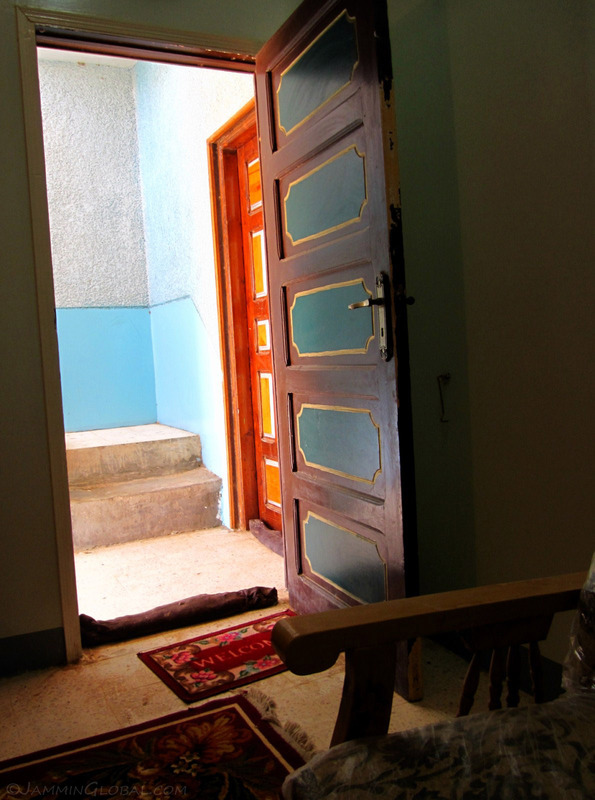 This room is separate from the rest of the house because of the Islamic tradition where strangers should not interact with the female members of a family, but strangers are still most welcome. Living in the harsh climate of the desert, humans have long learned to support each other, even those who are not kin. After a short while, Mohammed showed up with a fan and a tray of tasty Bedouin food. I like how the bread is evenly spaced around the tray. I was familiar with the green sauce, which was a leafy vegetable that when cooked had the stringiness of okra. The brown sauce was a lentil soup and especially for me, an omelet. We ate mostly in silence and I felt very bad for not learning more Arabic. During lunch, a friend of Mohammed’s, Ahmed, showed up and spoke English. I found out that they were teachers. Ahmed kept probing me for my views on the revolution and sensing his defensive nature, I diplomatically ended that topic. 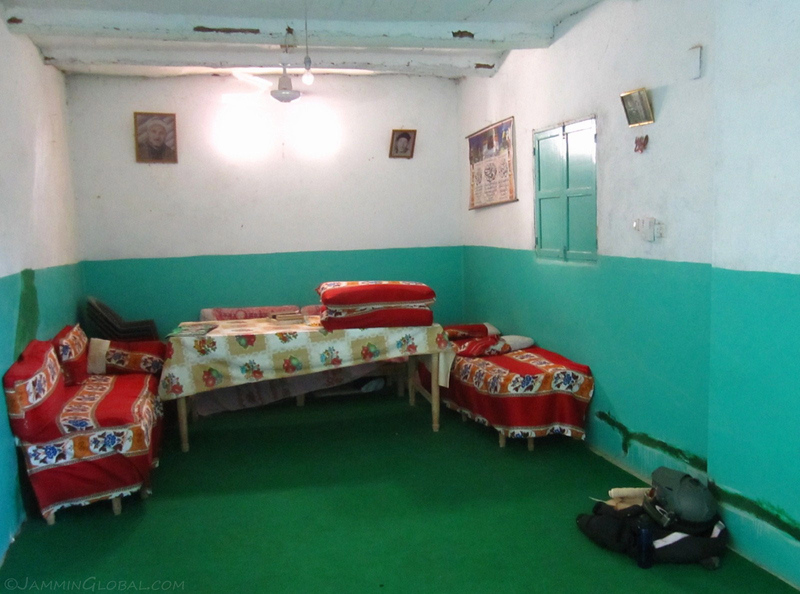 After lunch, I told Ahmed to tell Mohammed that I wanted to take a nap for an hour or so to beat the heat and they directed me to this open room with sofas under a fast-moving fan. The concept of a siesta, or a qayloulah in Arabic, was easily understood as all civilizations in hot climates have adopted the habit of a short nap after lunch to recharge the body for the rest of the day. I got some shut-eye for an hour, then took a shower and thanked Mohammed for his kind hospitality. I could sense a genuine feeling of care from him and understood a bit more of how the desert has shaped its people over the millennia. 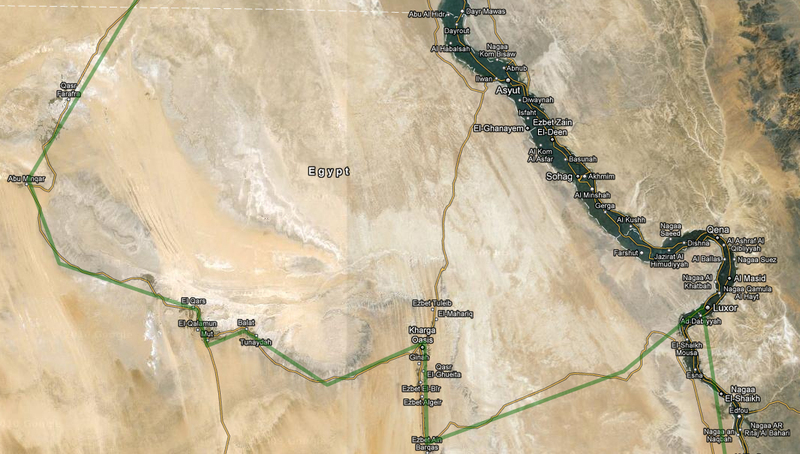 At 3 pm, I got back on the road and had about 220 kms (137 m) to go till Kharga. 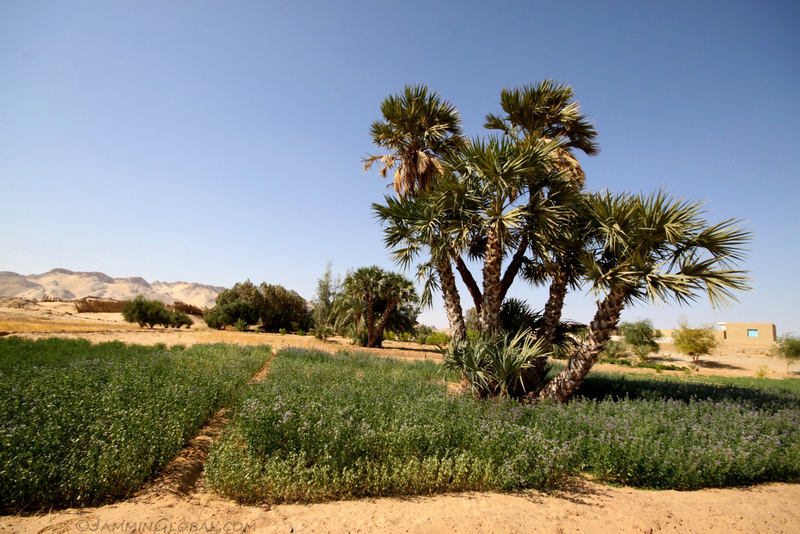 This greenery comes from the oasis of Dakhla. The heat was slowing letting up but the issue in the afternoon is that the ground has been heating up all day and starts re-radiating this heat back out, so I was still guzzling down water, about 7.5 L (2 gal) on this day. 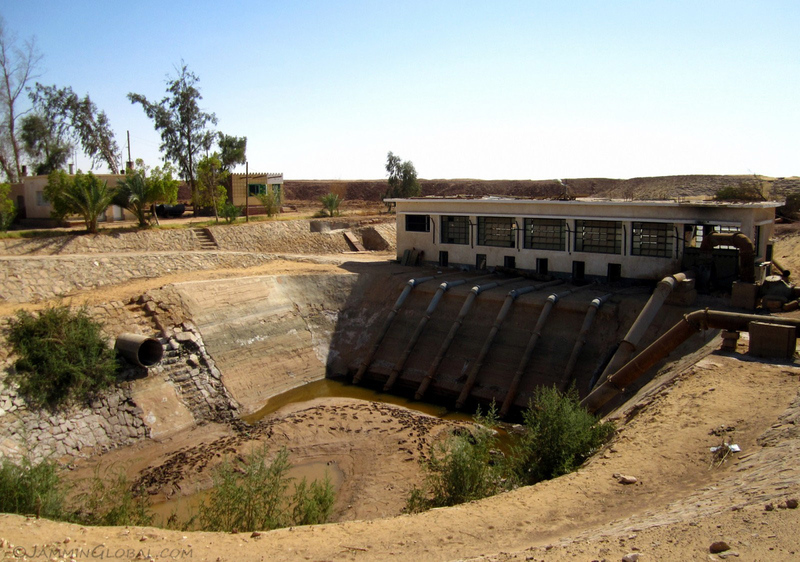 A water pump station in Dakhla, sucking up essential H20 from the underground aquifers that have kept these oases alive through the centuries. But I wonder how much longer the water will last when such industrial force is thrown behind the act of water removal, which was done by donkeys and oxen until the recent past. 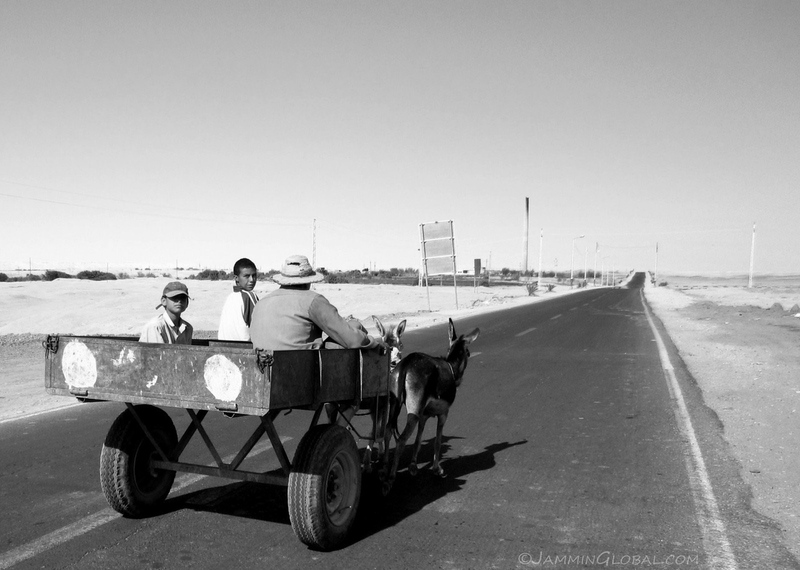 A donkey cart, the primary means of transport through the desert… until fossil fuels were discovered. 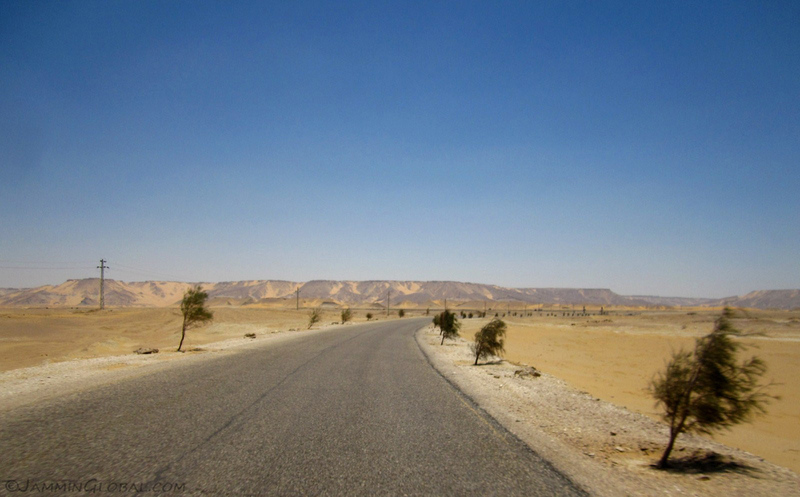 Enjoying the desert scenery as I neared Kharga. 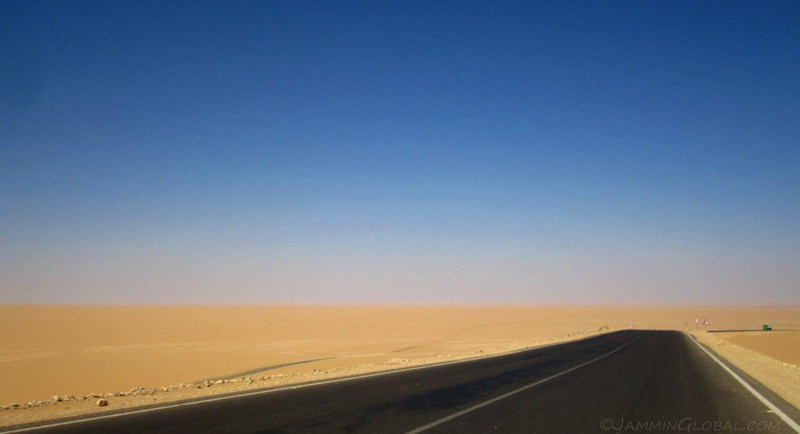 South of the Western Desert in Egypt is the Libyan Desert, which is of course mostly in Libya but also covers a large portion of southwestern Egypt. 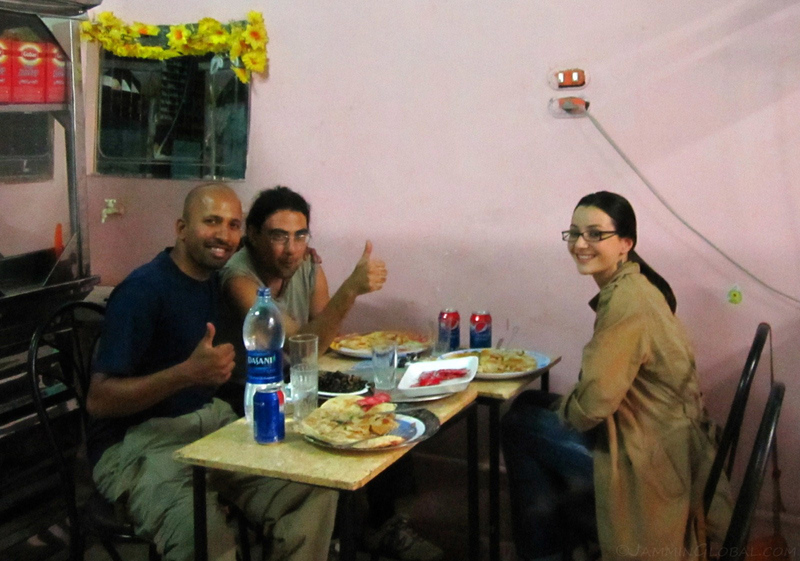 I reached Kharga just at dusk and met up with Mario and Christina, whom I contacted through CouchSurfing. They were both working for an Italian NGO here and were happy to receive a guest. Mario is the country manager for the Italian-Egyptian Debt for Development Swap Program and Christina recently joined his office. The program was set up so that instead of Egypt paying back its debts to Italy, it commits those funds to development work, saving on loss of foreign currency. We went out for dinner and had this crispy, flaky, almost pastry-like pizza. 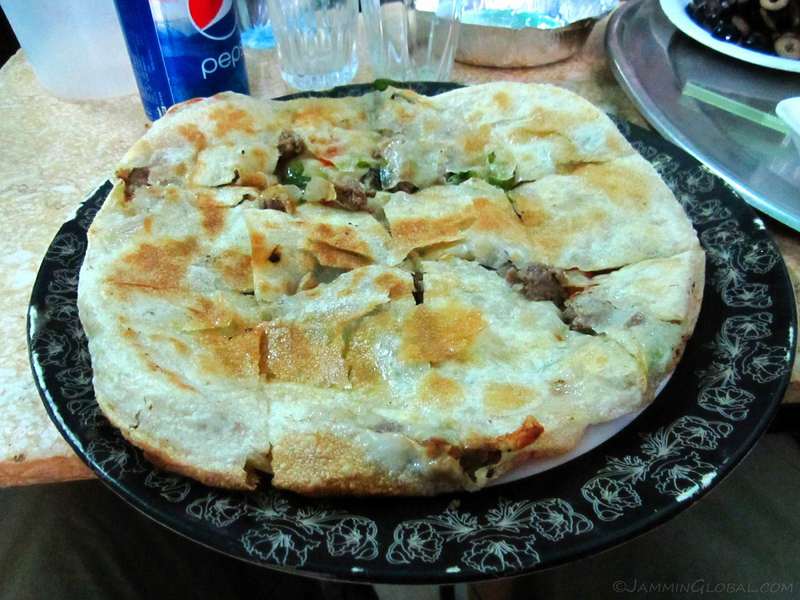 The cheese, meat and vegetables were on the inside and it felt more like a meat pie, but the crust was super thin. It was delicious and I enjoyed the fact that a huge bowl of fresh olives was served like a salad. 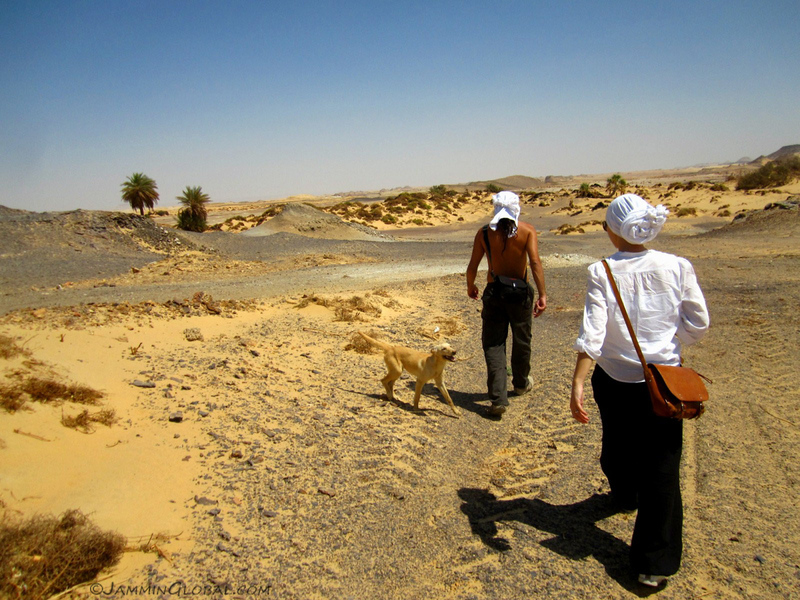 The next day, I accompanied Mario and Christina on a task they had to do in the desert. 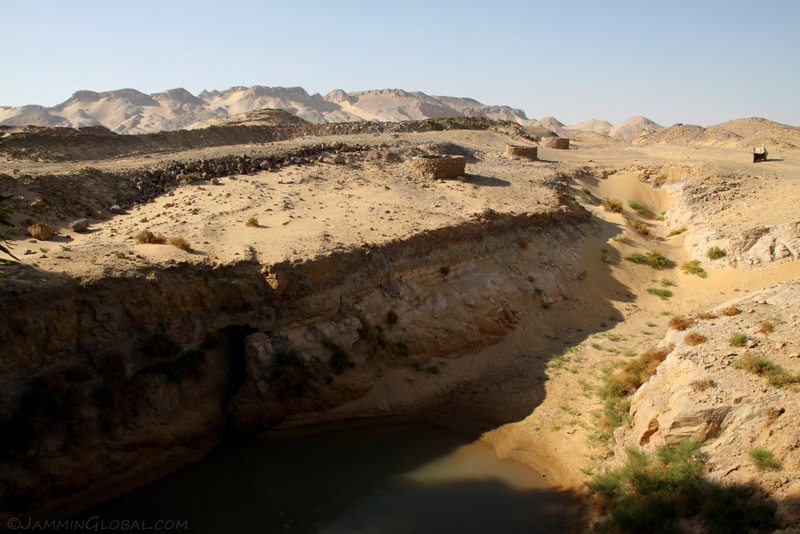 They were mapping all the areas of interest in and around Kharga to setup eco-tourism initiatives as a method of sustainable development. 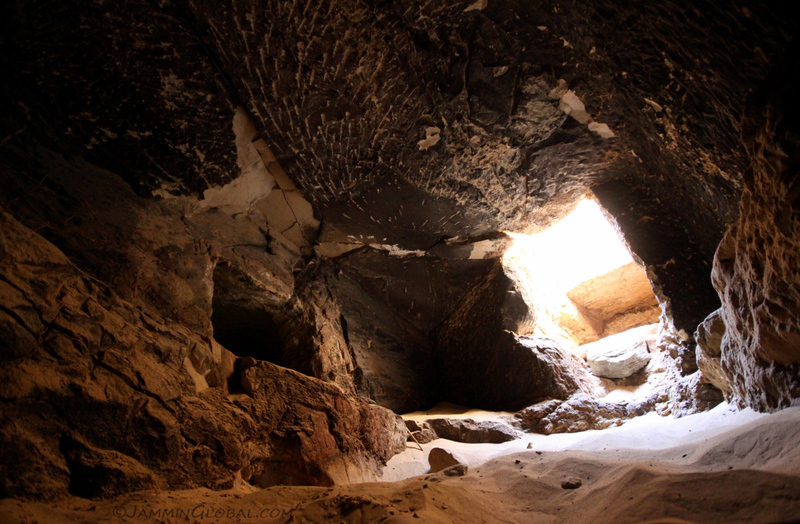 We arrived at Labakha, a site with a Roman fort that was taken care of by Sayed, who is Italian-Egyptian. 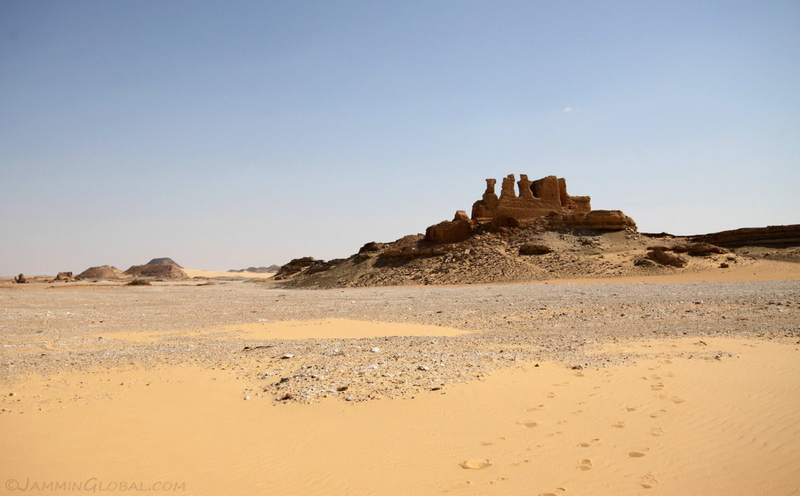 Like bread crumbs dropped to mark a route, out in the Libyan Desert, west of the Nile, are a series of Roman ruins. 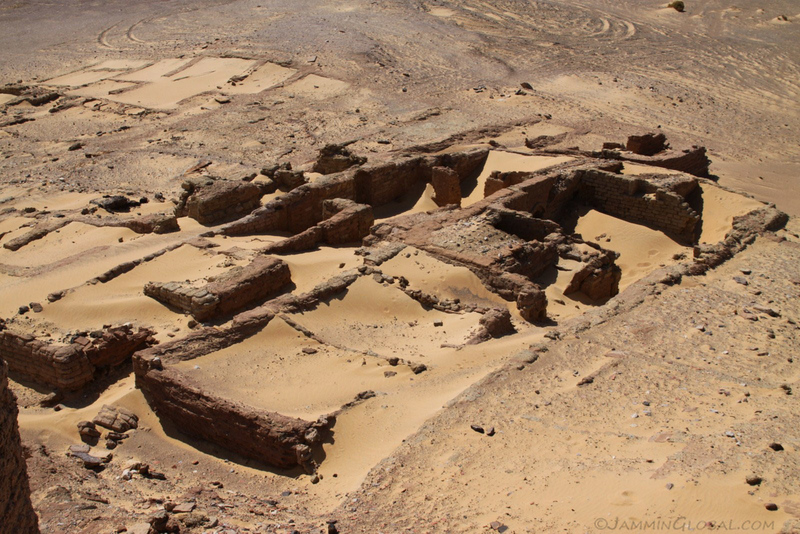 These ruins were once formidable forts that were built to protect the Darb el-Arbain caravan route that originated in Dafur, Sudan, and passed through oases along the way, through Kharga and ended further north in Asyut on the Nile. 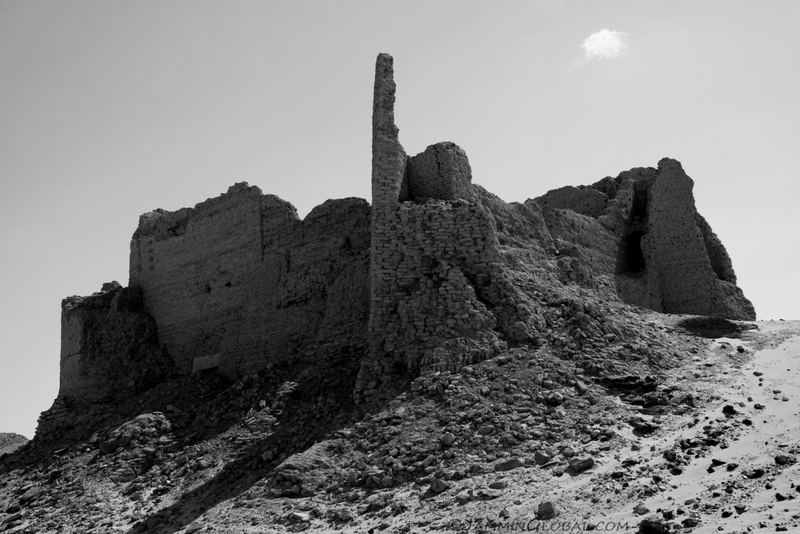 Mario was charged with taking detailed photos of the fort at Labakha so that a 3D visualization could be made for exploration in Google Earth to promote tourism in this area. We had to be there as close to noon as possible to reduce capturing shadows and that meant we were baking hot. The Roman fort at Labakha. It’s a grand structure and I can imagine how imposing it must’ve been on the landscape during its hey days about 2,000 years ago. Both Mario and Christina are from the present-day Rome area and I wondered if modern Italians feel a strong connection to their famous ancestors. Christina, by an outcrop of palm trees. They’re all huddling around a water source next to the fort. Around the time of Christ, the Roman Empire had established itself all along the Mediterranean coast, including Egypt. 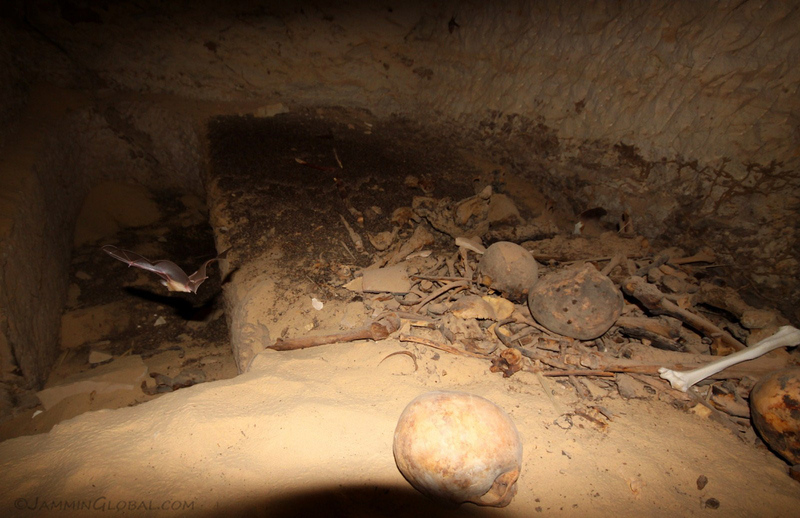 Most of present-day Egypt was under Roman control and the Nile Valley became the grain producer for the Empire. 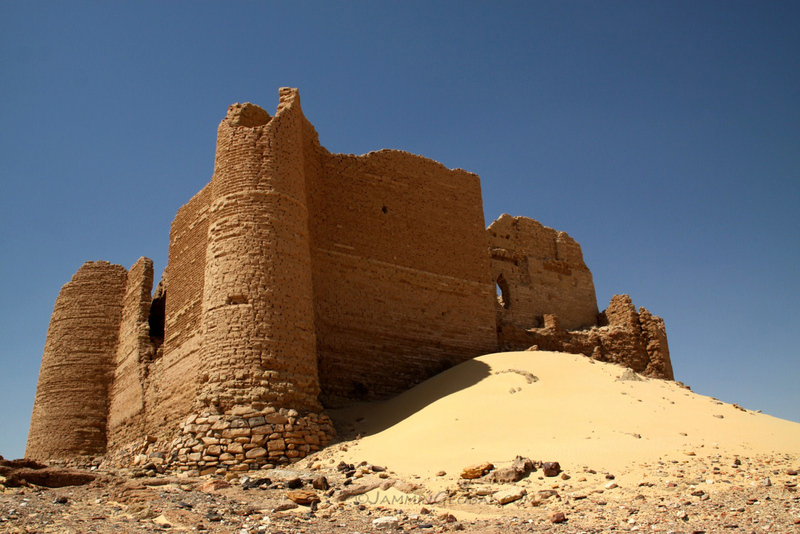 In the 4th century AD, the empire built fortifications all along its borders and Kharga, as its southernmost border, received a series of forts, such as the ruins of this grand structure. 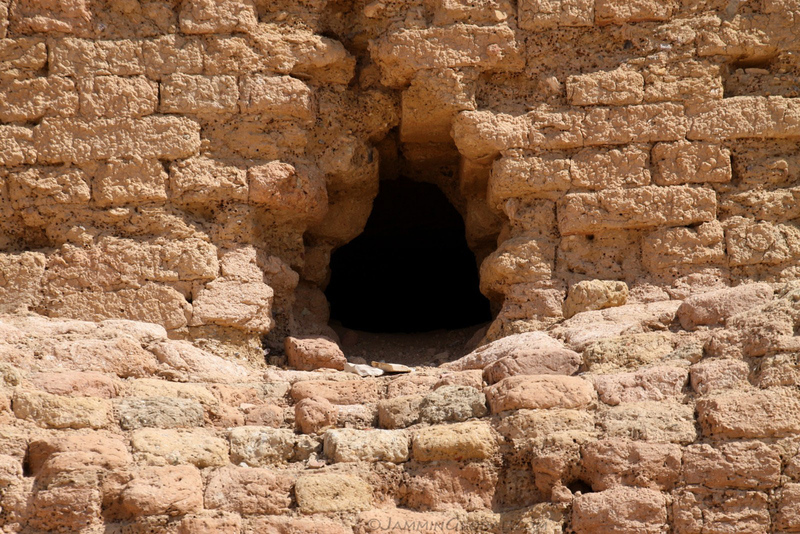 A hole in the wall… leading to a dungeon? The roof of the fort had long been brought down and no excavations have been carried out here, yet. I wonder where that tunnel leads to. 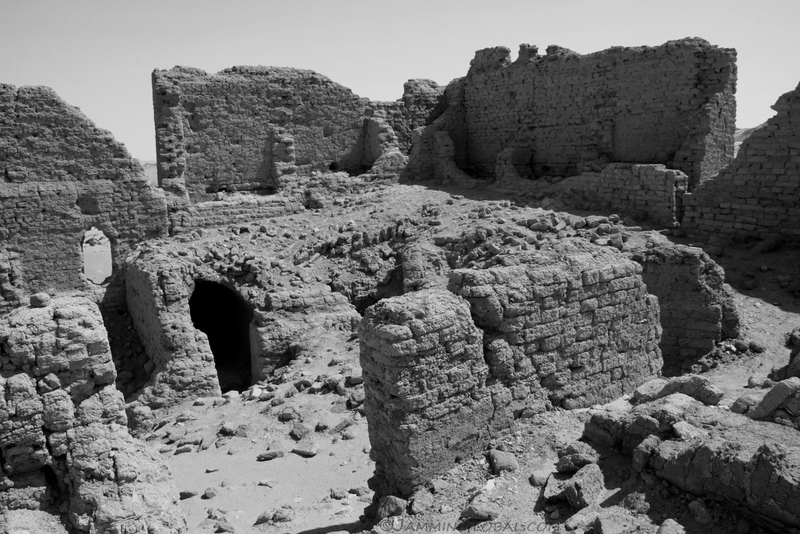 The ruins of living quarters, perhaps, next to the fort. 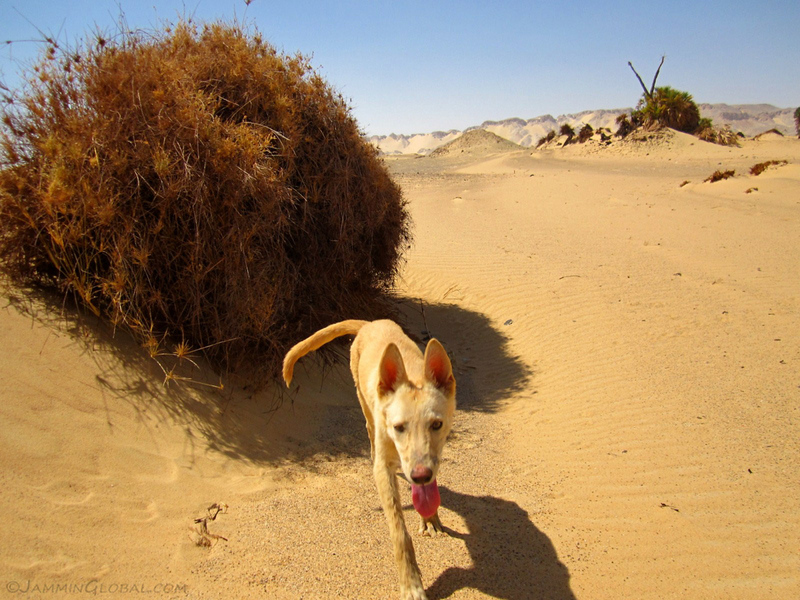 This thirsty mutt followed us across the desert from Sayed’s place and sought shelter from the oppressive heat under this bush. We shared some of our water with him. Near the fort, on an embankment, was an old Roman temple. 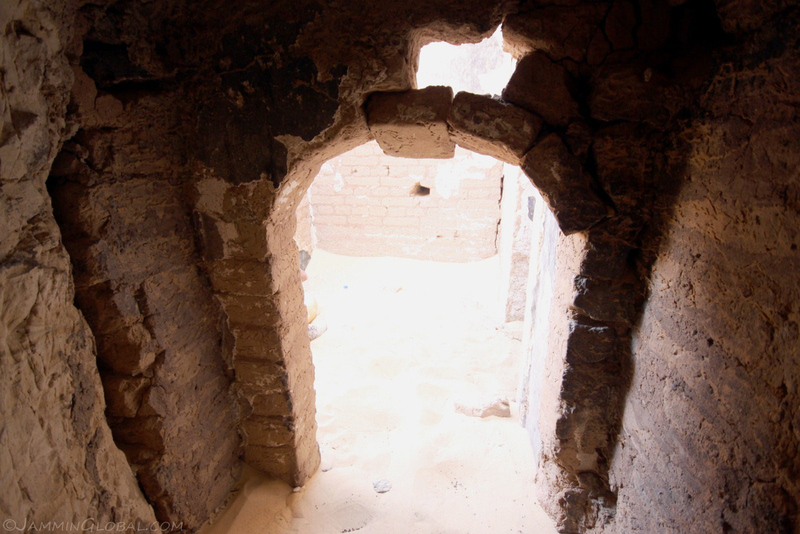 The arch in front of Mario had collapsed, but the mud bricks were still standing. Here’s a close-up of that bat. Amazing how taut its wings are. 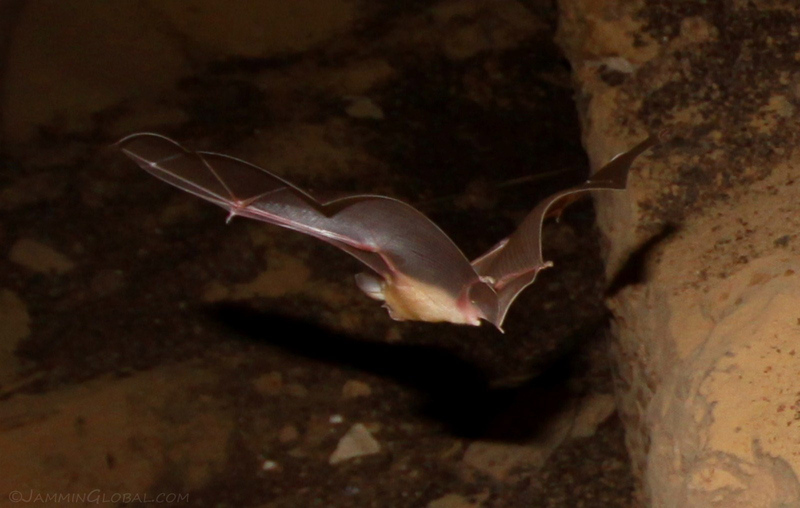 Bats are mammals, just like us, and provide very important ecological services, such as pollinating flowers (like bees) and pest control, reducing the need for fertilizers. It’s too bad that popular culture has demonized them by focusing on one variety (vampire bats) out of thousands that eat fruits and insects. On my way out of the tunnel, I noticed the loosely-held keystone of this arch that I went under. It’s going to fall down any day now. 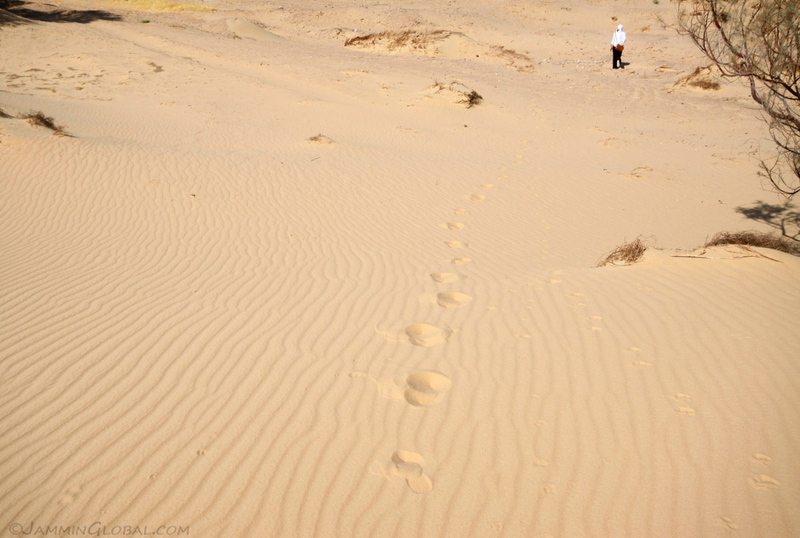 Footsteps in the sand… Walking back to Sayed’s compound. 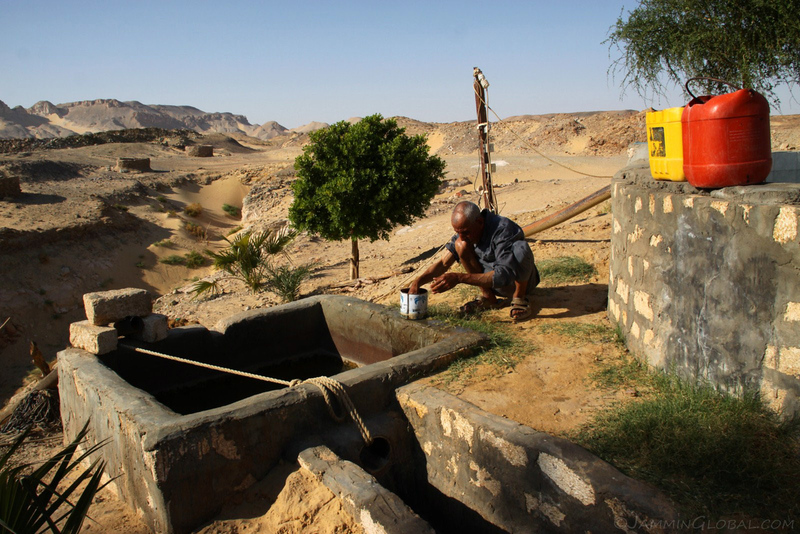 Sayed has tapped the underground water to feed his small oasis, growing date palms and alfalfa, the primary food for donkeys and horses here. We relaxed in the shade after our trek through the scorching heat of the desert. Sayed said he inherited this land as his family used to live here before and now he’s trying to set up an eco-tourist hostel, complete with mud housing for natural cooling. 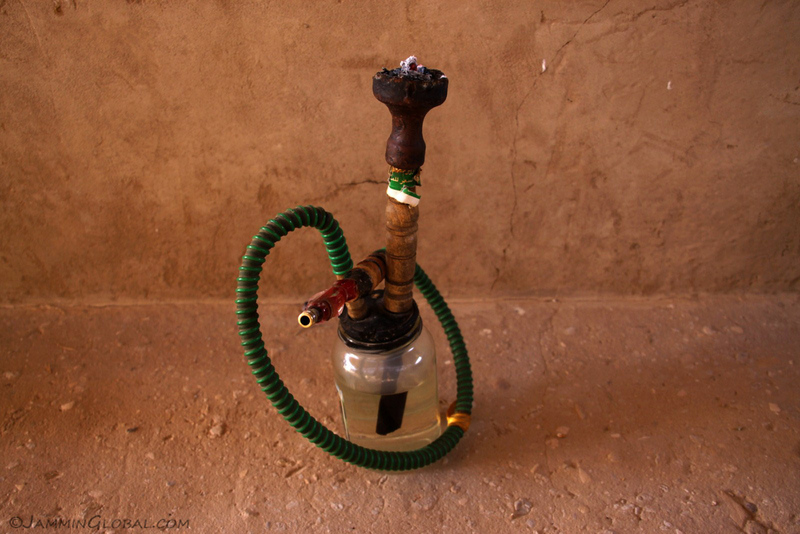 A home-made hookah for smoking sheesha. It works by having the incoming smoke being released under water and the outgoing pipe collecting this water-filtered smoke from the space above the water. A simple concept, probably as old as tobacco. 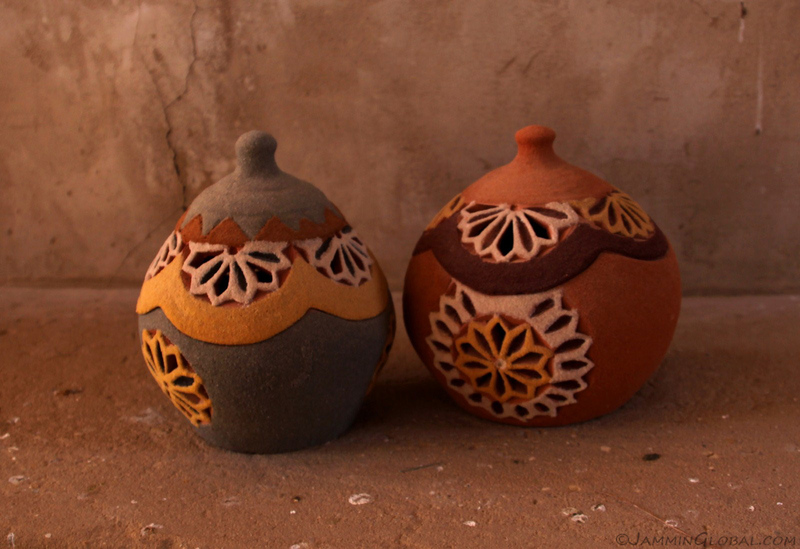 Pottery made by Sayed and decorated with naturally-occurring colored sand. 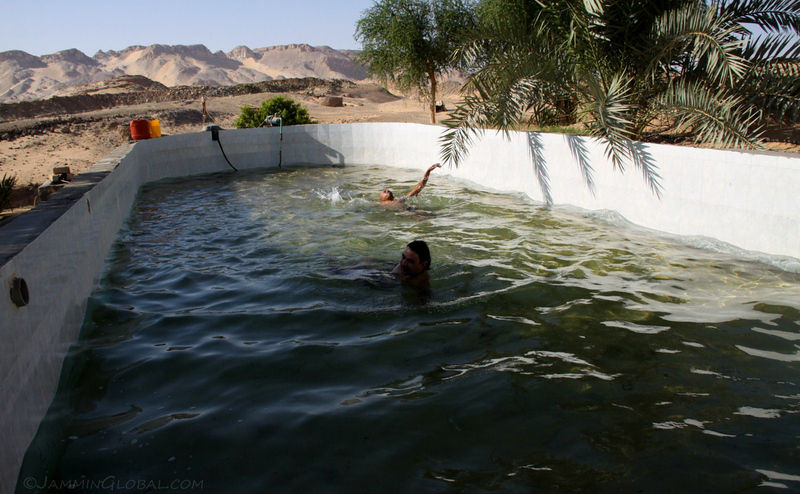 After cooling down our body temperature, Sayed said we could now jump in his pool. Wow, that felt refreshing. It was surprisingly quite cold as the water isn’t exposed to sunlight until it reaches the surface. Sayed showed me how the water comes from a spring up in the hills and the Roman-built infrastructure was still working to this day, delivering fresh, cold water to his oasis. The opening in the rock, in the lower left, is the end of the passage that carries water from up in the hills. 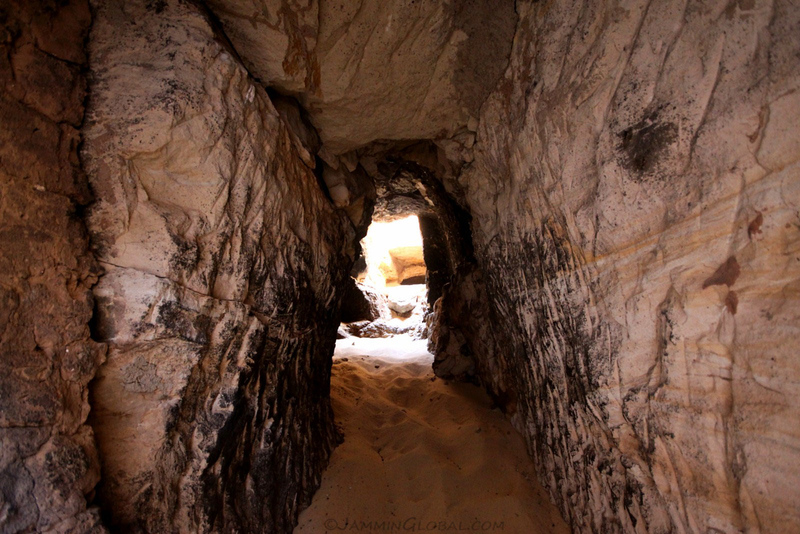 The series of wells were service points to get down and unclog rocks or sand. 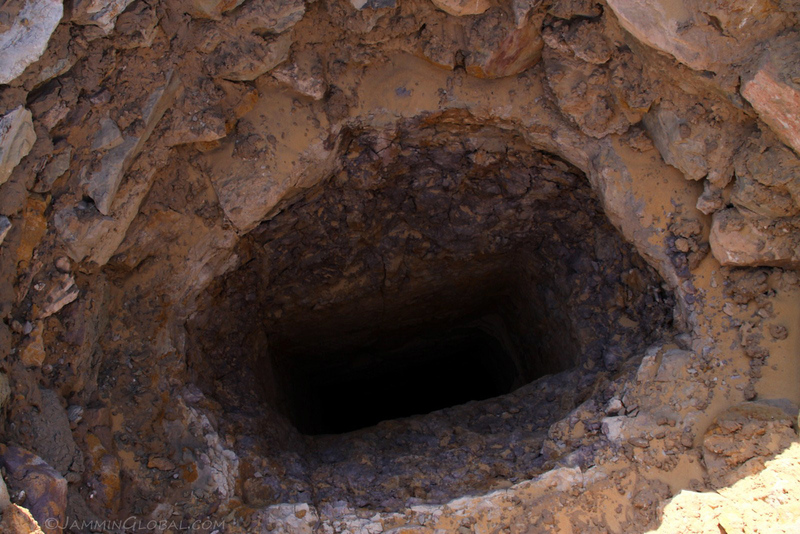 These service wells were dug 2,000 years ago and their structure is still standing till today. A close-up of the surface of the water as seen from a service well. 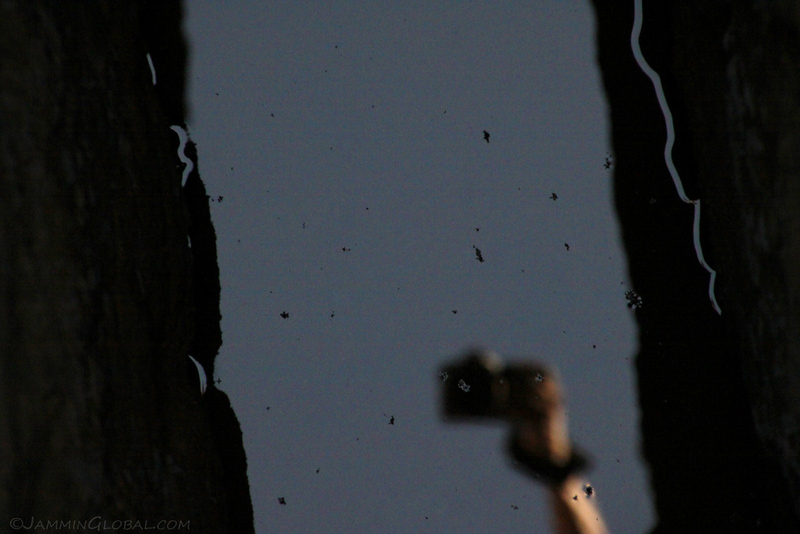 Looks like a couple dead insects and the reflection of my Canon 50D SLR with a Tamron 18-270mm lens. This shot was taken at the maximum focal length of 270mm. 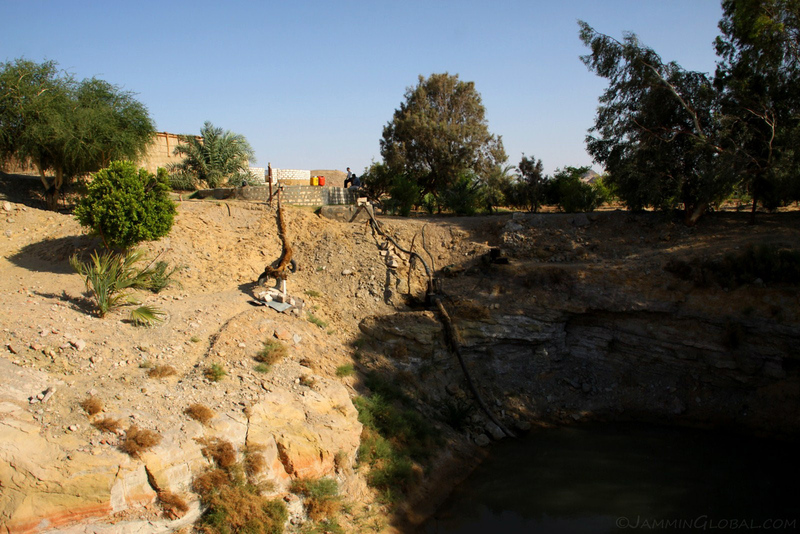 The huge well that supports Sayed’s oasis. He’s got a very nice property out here and he’s hoping Mario and Christina’s efforts pay off in bringing more tourists to Labakha. We got back into town and Mario and Christina said they’d like me to prepare my signature chicken curry for them. First thing on the shopping list: a chicken. We went with their driver and picked up a fresh bird. Its throat was slit and after a few minutes in a rotary machine, most of its feathers came off. 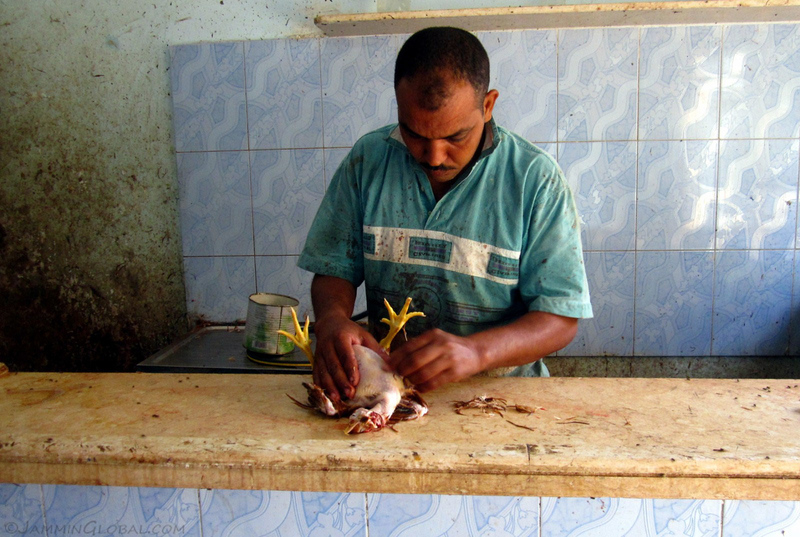 The butcher put the finishing touches on the bird and we had a freshly-slaughtered chicken for a curry. Next up was vegetables. My recipe is very simple and requires onions, tomatoes, ginger, garlic and chilies. 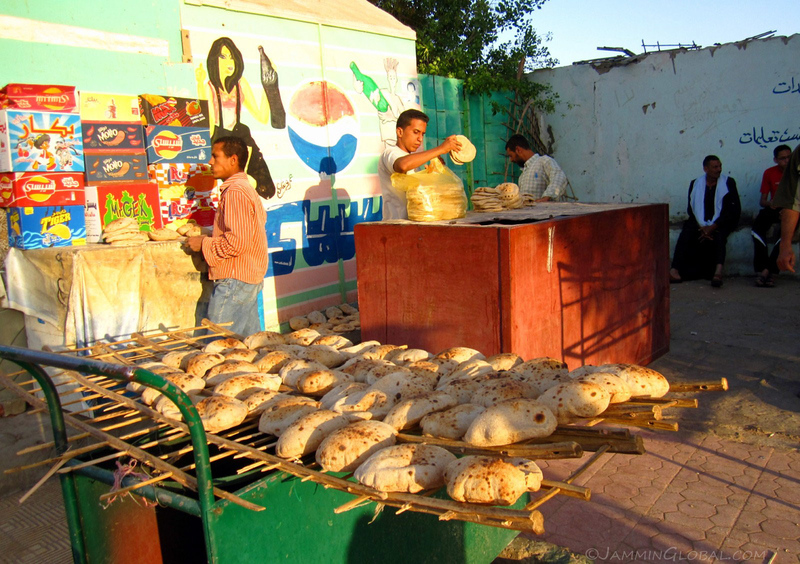 On the way home, we passed this street seller who had freshly-baked bread for the evening meal. 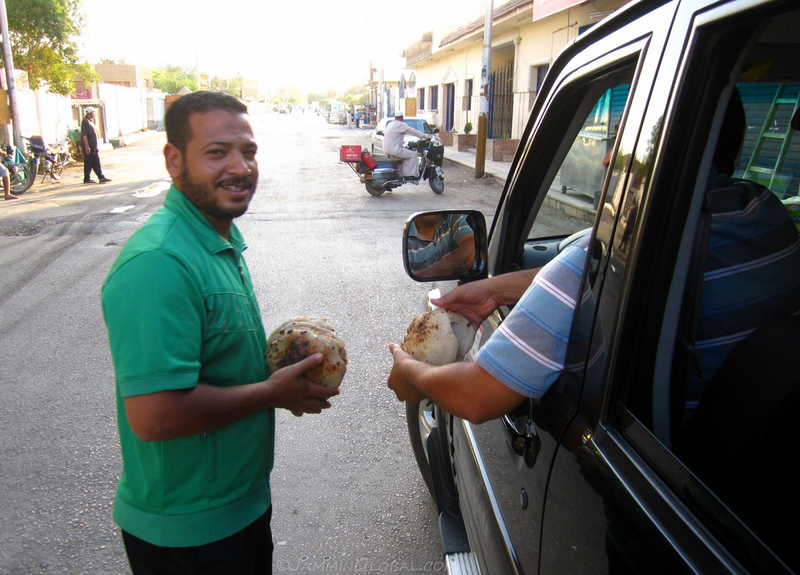 Picking up some fresh bread for the driver and some for us. Scars of Egypt’s Revolution. 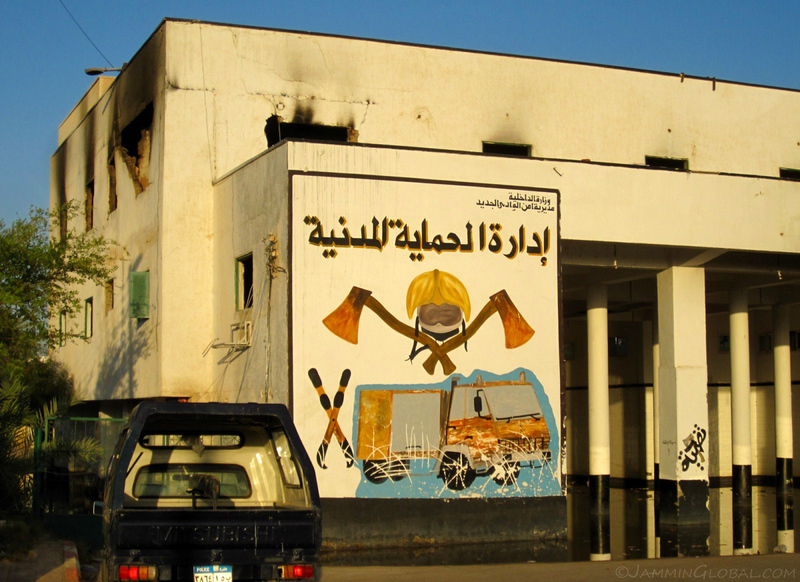 We passed Kharga’s Fire Station on the way home and Mario pointed out how during the early days of the revolution (January 2011), this fire station and some police stations were set on fire by protestors. 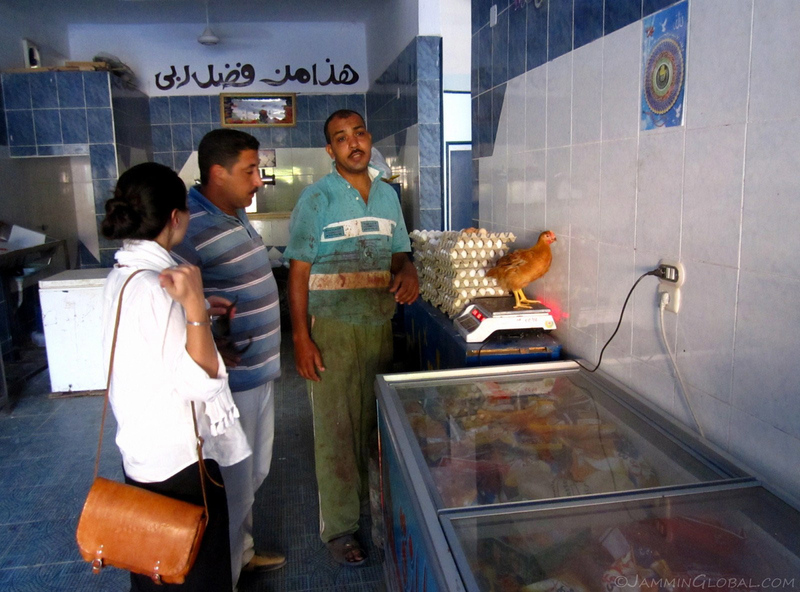 Cooking my chicken curry for Mario and Christina as a way of saying thanks for my wonderful time in Kharga. 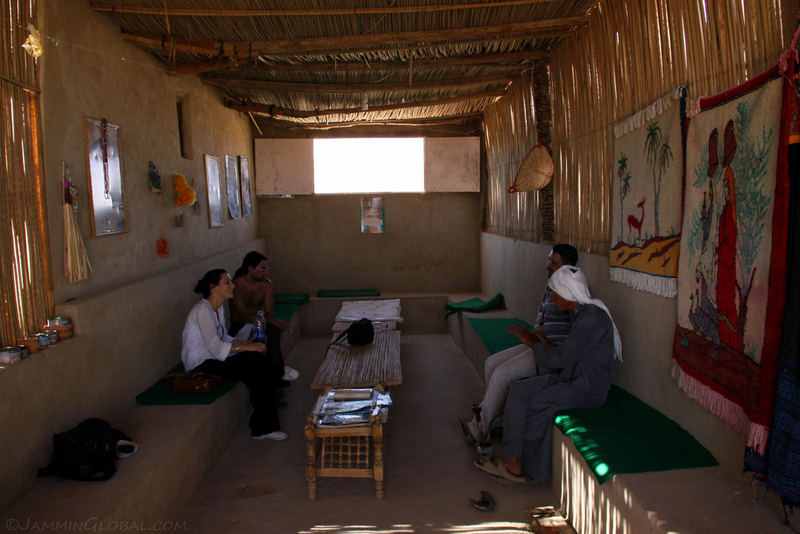 They invited me to stay longer as there was much more to see here, but I was running of days on my Egyptian visa and had to get to Aswan within the next week. I’m so grateful for a network like CouchSurfing.org that puts like-minded travelers and hosts together. 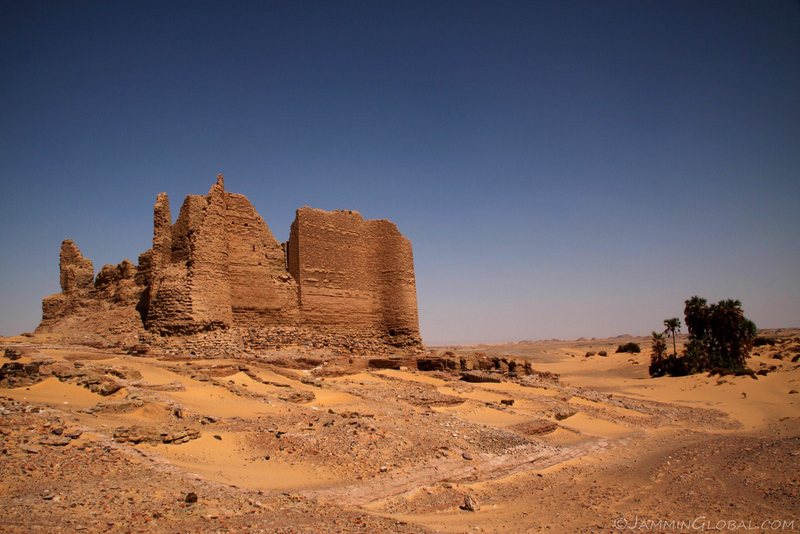 In a span of just two days, I had a rich experience of Kharga, which probably wouldn’t have happened if I was just staying in some cheap hotel and following a guide book. 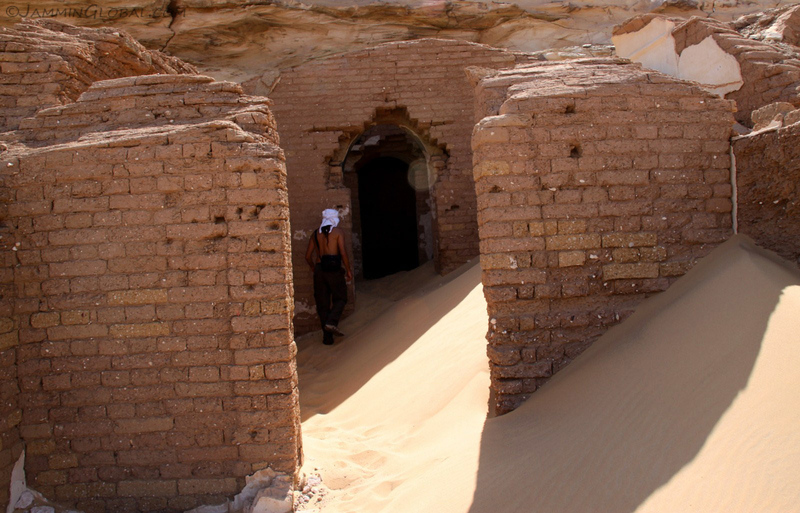 The excursion out to the desert to see the Roman fort at Labakha was an insightful trek into the long and storied history of these deserts. 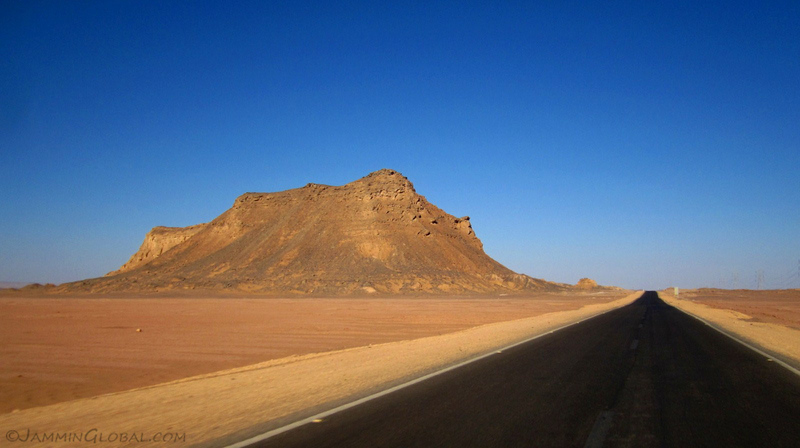 I’m also thankful to Mohammed and our chance meeting on the road outside Dakhla. He reinforced what Bedouin hospitality is all about and affirmed my choice to travel by motorcycle, which makes encounters like this all the more possible. 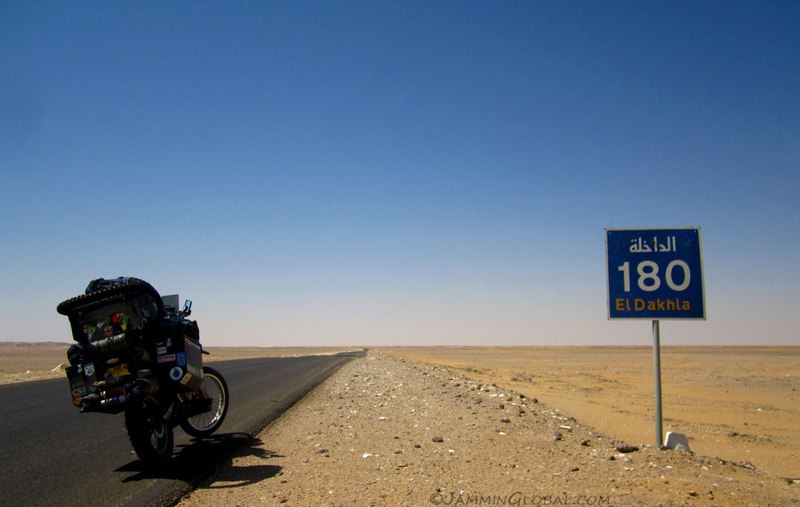 I am enjoyin every minute reading your blog..I am Egyptian adv rider and glad that you enjoyed your 2 weeks trip in Egypt..